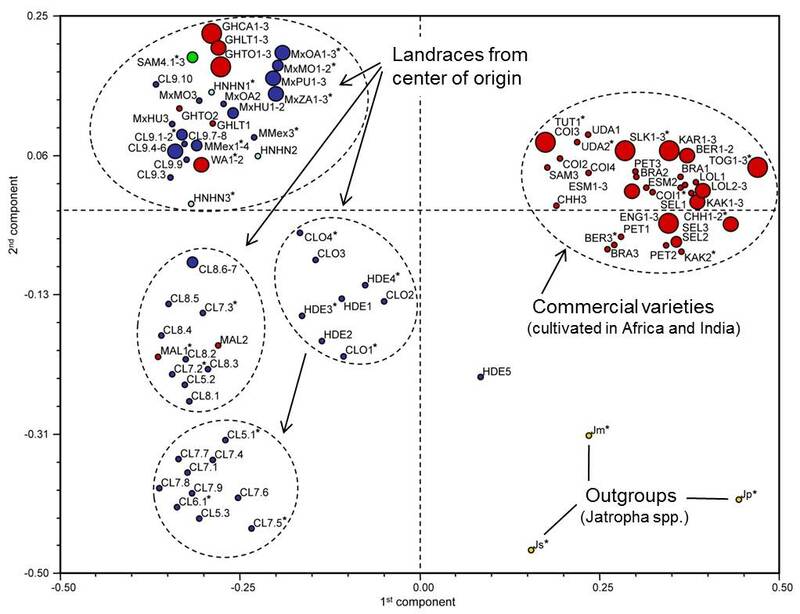 All topics touching on Jatropha’s plant genetics. In the second half of August we successfully germinated the first three F2 generation seedlings from one of our interspecific hybrids. 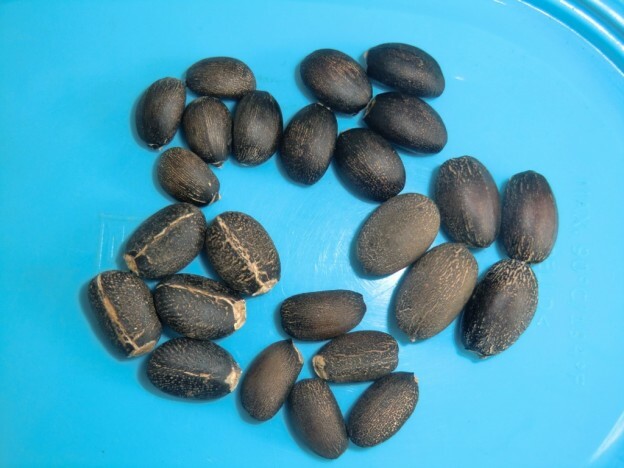 From now on we have fast growing F2 Jatropha interspecific hybrids for further breeding. 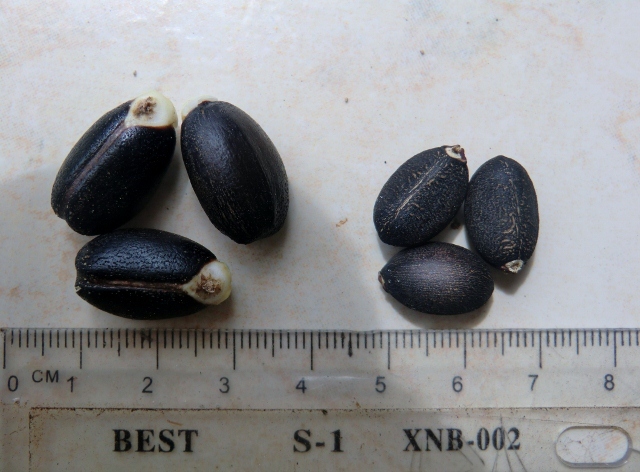 While some research reports indicate that this type of interspecific hybrid is sterile or not interesting for breeding, we observe ongoing successful seed development on several of our early F1 plants deriving from different Jatropha curcas female parents. So we expect more additions to this F2 generation population in the near future. As expected from applying simple Mendelian rules the F2 generation phenotypically exhibits much more diversity than the F1 generation. All of the 3 seedlings we have so far appear strong and healthy. However, only the one on the left hand side seems to be as fast developing as expected while the other 2 are only moving along slowly. 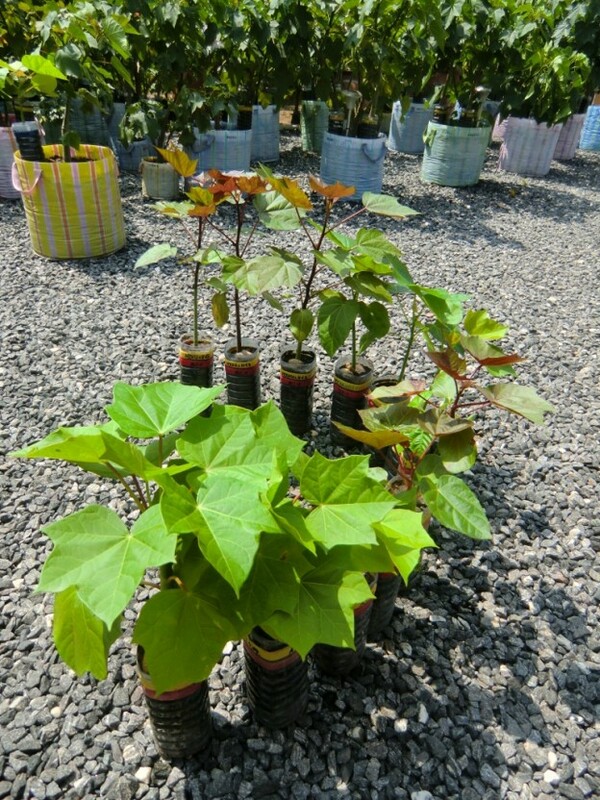 We expect our F2 interspecific population to grow very fast over the coming months involving many different F1 interspecific parents with genetically very different Jatropha curcas parents in turn. Currently many F1s are initiating their first flowering. On the interspecific route of our breeding program this is really what we have worked on for almost 3 years. We have clearly begun moving into terrain which has not previously discussed in the scientific literature to the best of our knowledge. 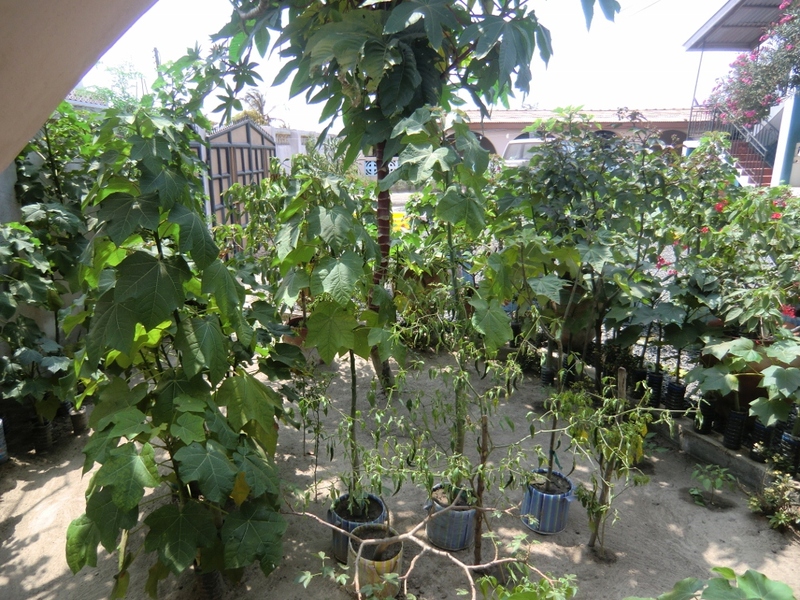 This development marks another success in achieving our initial target to bring as much variability into the germplasm available to our Jatropha breeding platform for future improvements through selection. We are now able to start work on a real ground breaking next step we had been planning for since we did the first interspecific cross almost 2 years ago. With a little luck first results will become visible before the end of the year. Further observations on the interspecific breeding route will be published here as much as possible, but of course we will have to start protecting our intellectual property where we reach the forefront of commercial hybrid development as we are expecting a meaningful patent application before too long. This entry was posted in Breeding, Breeding program, Genetics, Interspecific hybrids, News and tagged breeding milestone, F2 on September 16, 2012 by Ulrich Riemann. Before our proof-of-concept phase officially came to an end on June 30th, 2012 we succeeded in taking our efforts to the next level. 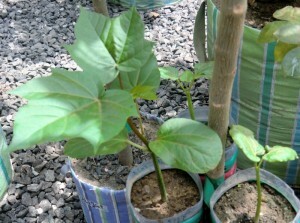 Our first Jatropha hybrid backcrosses have germinated and reached seedling stage by mid June. This achievement marks an enormously important step forward for the Bionic Palm Jatropha breeding program. The above picture shows the huge variability among our earliest BC1 seedlings. Over the coming months this collection will grow into the hundreds. We aim for a BC1 population incorporating all of our original parental germplasm and most of its cross combinations. Thus we will gain the maximum possible genetic variability base which we can later draw from when we breed for truly superior commercially usable hybrids. What we define as our BC1 population is the result of back-crossing interspecific Jatropha curcas x Jatropha integerima hybrids into our parental Jatropha curcas accessions. This is a standard breeder’s approach if he wants to transfer specific traits (certain properties) from a related species into his species of interest. However, we are not into pedigree breeding at this time. Our primary aim is still to increase genetic variability of our population to the utmost possible. We are looking for the greatest possible heterozygosity in these plants which can be assumed to be 100% in many cases. According to scientific research reports on the genetics of Jatropha this can only be achieved through an interspecific breeding route. While this kind of approach is very time consuming we do expect to gain a substantial shift in the Jatropha genetics. This entry was posted in Breeding, Breeding program, Genetics, Interspecific hybrids, News and tagged back cross, BC1, breeding milestone on August 23, 2012 by Ulrich Riemann. A couple of weeks ago we have successfully reached a very important milestone of our breeding program: the first interspecific hybrid was flowering. As of today we are in the middle of a sister hybrid flowering with at least 4 others approaching the same stage. Also, the initial F1 plant is already showing the next 2 inflorescenses which might indicate a very active flowering trait. So what have we done since the F1 flowering commenced and what are the next steps going to come? First of all on the very first pollinated hybrid we have 5 fruits developing well. They have all been manually pollinated with various non-toxic pollen donors over 3 weeks ago. In addition, this hybrid provided pollen to a most promising non-tox variety luckily flowering at exactly the right time. So we have 3 BC1 (first generation back cross) fruits developing. The second hybrid which is in the middle of an extensive multi-week flowering processes right now has opened 13 female flowers so far over the last 5 days. They have all been manually pollinated utilizing 4 different pollen sources. This flower shows a lot more buds that are going to open more female and a lot of male flowers over the coming days. 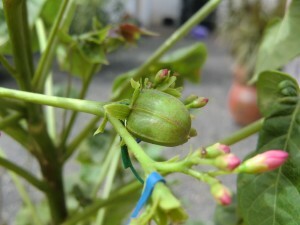 The very delayed process of individual flower openings is extremely helpful (obviously a trait crossed into the JcL from the other Jatropha species used), as it increases the chances of many interesting successful cross pollinations. For this type of interspecific F1 hybrid we already have over 50 samples deriving from 8 genetically different JcL accessions. This type of crossing will become a standard process step with all new JcL accessions we aquire. Currently we have over 25 proven distinct accessions growing with initial flowering expected between 1 and 10 months out. About 1/3 tested as non- or low-toxic. 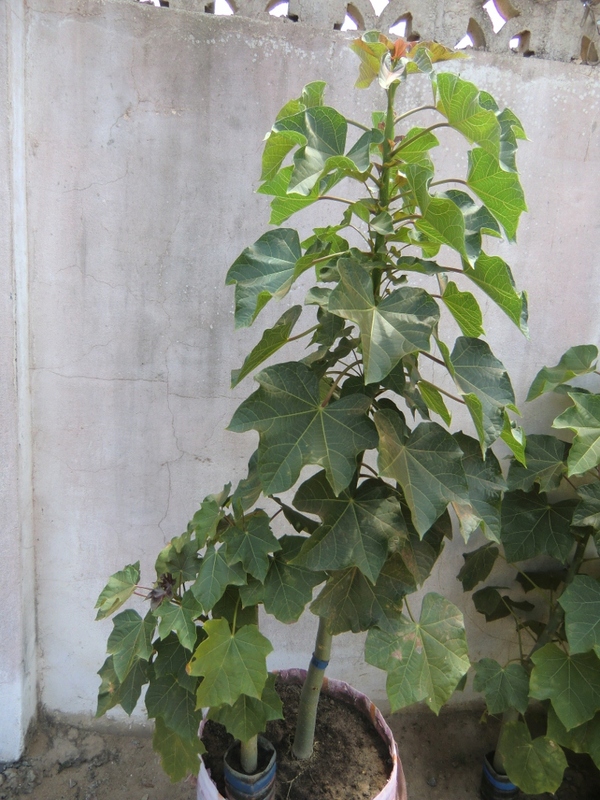 Some of the readers might have by now identified the other Jatropha species used in this hybrid. Actually this route of hybridization has been described in scientific reports several times in the recent past. The more we are surprised how little information is publicly available about the characteristics and various crossing options it offers. It seems, that so far nobody explored this hybrid in-depth instead of rushing on to the next generations. Seeing the huge potential I find this a bit astonishing. It seems to be the result of many research projects being tied to limited time and funding. As it takes 18-24 months to get a flowering F1 hybrid and most public research funding today is on a 3 year basis, we can understand, how the project time remaining was running out. Therefore, we might very well be the first breeding program that has the capability of scratching a little deeper into the vast potential variability of that F1 generation. This will of course quickly lead to hundreds or even thousands of plants in the first generation alone and result in millions of plants one or two generations further down the road. So we are already looking for ways to reduce those enormous numbers. This entry was posted in Genetics, Interspecific hybrids on March 13, 2012 by Ulrich Riemann. We have arrived at and actually already passed one of the most important milestones of our breeding program: our first interspecific Jatropha hybrid has opened flowers this morning. While we are still awaiting the outcome of a large number of other breeding results, this hybrid clearly exhibits several of the expected traits: a very short period of time from seeding to flowering (less than 4 months), a very positive female:male flower ratio and a relatively good resistance against the mealy bug. This plant is a key outcome of our proof-of-concept phase and represents a highly successful intermediate step on the way to our core breeding objective: the creation of a high yielding, non-toxic Jatropha variety exhibiting a high level of horizontal resistance specifically in West African ecosystems. 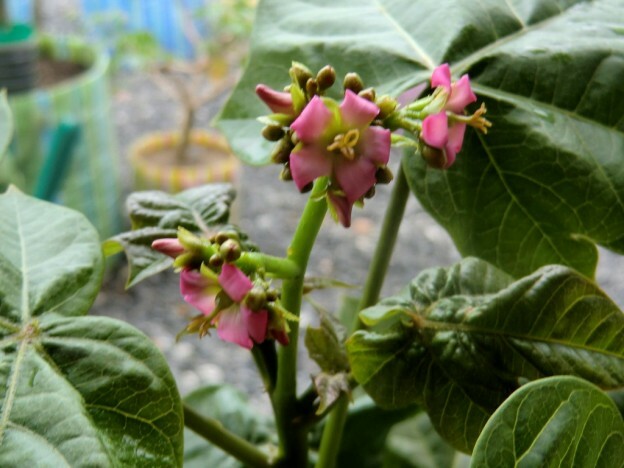 The three visible female flowers have already been pollinated manually according to the pre planned breeding paths of which the most important one will be back crosses with selected non-toxic and toxic Jatropha accessions with superior traits. According to current experience we expect a next generation of breeding plants within 6 months. This entry was posted in Company, Genetics, Interspecific hybrids on February 14, 2012 by Ulrich Riemann. A major reason that motivated us to look into JcL breeding goes back to a devastating pest attack. Starting about 2 years ago the Papaya Mealy Bug arrived. It settled down heavily on all our JcL hedges and also infected tomato and pepper plantings. During the very dry year 2010 we lost almost all our crops to this bug. Studying the little options available to fight the plague (of course the industry is willing to sell you tons of different pesticide products, but they don’t really work) of course breeding for resistance was an interesting way forward. As we had started looking at breeding for yield and removal of negative toxic effects anyway, it soon became clear what the three primary objectives for our breeding program would be: (1) yield (2) absence of toxicity and (3) resistance. Breeding for resistance is an extremely controversial subject and past attempts have done a lot of damage to specific crops and ecosystems that play a major role in today’s overzealous use of chemicals in agriculture. Recently I stumbled over the very enlightening books of Raoul A. Robinson, especially the one called “Return to Resistance”. (All of Mr. Robinson’s books can be downloaded for free from the internet, just google his name) In this book he lays out the problems around vertical (one gene) resistance and makes the case for horizontal resistance, with the latter being a potential remedy for many of the current food shortages. Horizontal resistance is a multi-gen trait of a plant that is permanent similar to the kind of resistance wild plants obviously have. In commercial corps in can be achieved through continuous cycles of mass selection from self crossing accessions which will inevitably improve resistance more and more until an upper limit is reached. The larger the range of genetic variability in the breeding population, the better. We have decided, that we will give this approach a similar chance as the “Mendelian” approach where we cross breed intra- and interspecific hybrids looking for the best combination of traits (pedigree breeding). We actually believe, that introducing interspecific hybrids with their greater genetic variance can help improve the start-up population for the mass selection population. Anyone with some interest in the subject should definitely have a look at Raoul Robinson’s books. You don’t have to be an agronomist or a plant breeder to understand his work. I can only highly recommend it. This entry was posted in Genetics, Interspecific hybrids on August 9, 2011 by Ulrich Riemann.